Explore the sublime beauty of the Andaman Sea on a 30-min snorkelling adventure at Elephant Beach. This relaxing day trip begins with a boat ride from Havelock jetty. The boat speeds across the Andaman Sea, with tropical scenes of the Havelock Island on the horizon. At Elephant Beach, you can engage in a half-hour session of snorkelling and swimming in the teal blue waters of the sea. Experienced snorkelling instructors will be present to guide and assist you at every turn. After snorkelling, you can also spend time sun-bathing at the beach, with beautiful views of the sea. Elephant Beach is a soft and sandy beach on the coast of Havelock Island. The secluded beach is accessible only via a boat ride from Havelock jetty or a 2-hr trek across tropical rainforests. The pristine, turquoise waters of the Andaman Sea at Elephant Beach make for one of the best spots for snorkelling and swimming. The underwater visibility is relatively high, providing exquisite and unfiltered views of the sea. The silver white sand of the beach, peppered with the trees of a tropical forest, make for a great spot to kick back and relax after half an hour in the Andaman Sea. • Engage in a 30-min snorkelling session to Elephant Beach. • Explore the snorkelling spots in the Andaman Sea. • Spend a relaxing holiday at Havelock Island. • Take a boat ride to get tropical views of the island. Consumption of alcohol, drugs, tobacco products and cigarettes is strictly prohibited during the Elephant Beach snorkelling trip. Travellers are required to follow instructions of the dive instructor during the Elephant Beach snorkelling trip. All cancellations made 15 days or more before the scheduled Elephant Beach snorkelling trip: 50% refund. All cancellations made less than 15 days before the scheduled Elephant Beach snorkelling trip: no refund. The start time of this snorkelling trip to Elephant Beach are flexible. They can be changed to suit your timing and convenience as well. The tour operator takes utmost care to ensure safety of the travellers and shall not be held responsible for any mishap, accident or loss of life during the snorkelling trip to Elephant Beach. The tour operator reserves the right to cancel or alter the itinerary of this Elephant Beach snorkelling trip due to any unforeseen circumstances like bad weather. Any extra costs incurred due to such changes are borne by the traveller. Go snorkelling at Elephant Beach! Report to the Havelock Jetty by 09:30 hrs. Here, you'll board a boat that will take you to Elephant Beach. With beautiful views of the Andaman Sea and the Havelock Island, you'll speed past the Havelock Island lighthouse and arrive at Elephant Beach. Here, you'll engage in a 30-min snorkelling session, with the help of experienced snorkelling instructors. After snorkelling, you can take some time to rest at the beach, before taking boarding a boat back to Havelock jetty. Your trip ends here. Havelock Jetty is accessible via frequent ferries from Port Blair. You can board a flight to Port Blair's Veer Savarkar International Airport and travel to Havelock Jetty in a ferry. On the Havelock Island, the jetty is accessible via local transport of taxis/private cabs. 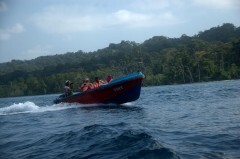 The tour operator will arrange your transport to the start point of the Elephant Beach snorkelling trip.